From arts to science & engineering, Dalhousie University is one of the top academic and research institutions in Canada. See here for more information on the different programs available. Many scholarships are available through Dalhousie and other funding services. It is highly encouraged that you all to apply for scholarships. Head to this link for more info on scholarships, or chat with your high school guidance counselor for more opportunities. Your education is of the utmost priority to our coaching staff. Our coaches, namely head coach Mark Haggett has an open door policy when it comes to discussing academics. With the Tigers, you are a student first and athlete second. In the case of any academic issues or even if you would like some guidance with studying or manuvering your way through a fearsome first year of university, our upper-year students and executives will be there to support you all the way through. We would be happy to set you up with an upper-year player or coach to experience the Dalhousie campus first hand. Send an email to football@dal.ca if you are interested. 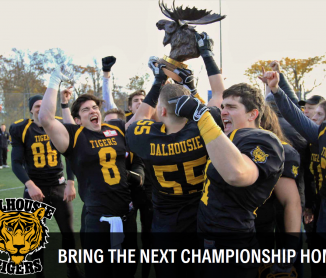 The Dalhousie Tigers Football team competes in the Atlantic Football League, which consists of four teams: Holland College, University of New Brunswick (UNB) Saint John, and UNB Fredericton. The Tigers won their first championship since 1954 in 2016. We’ve had many high level students, including engineers, doctors, and law students pass through our program’s doors with great success. Football season is a busy time of year for everyone – our coaches, players, volunteers, executive members, and physiotherapists. Despite the stresses that first-year university brings, being a part of a tight-knit family of Tigers is the best environment that you could possibly have. Please send an email to football@dal.ca if you have any questions about the recruiting process.